Direct view of North Sea dike and Wadden Sea. Spacious 2-room apartment in the house "Kiek över'n Diek" with about 60 square meters on 2 levels (1. Floor, DG) for up to 5 people. In beach near location in the district Ording in St. Peter-Ording directly on the dike, you can enjoy the evening sunset from the balcony. 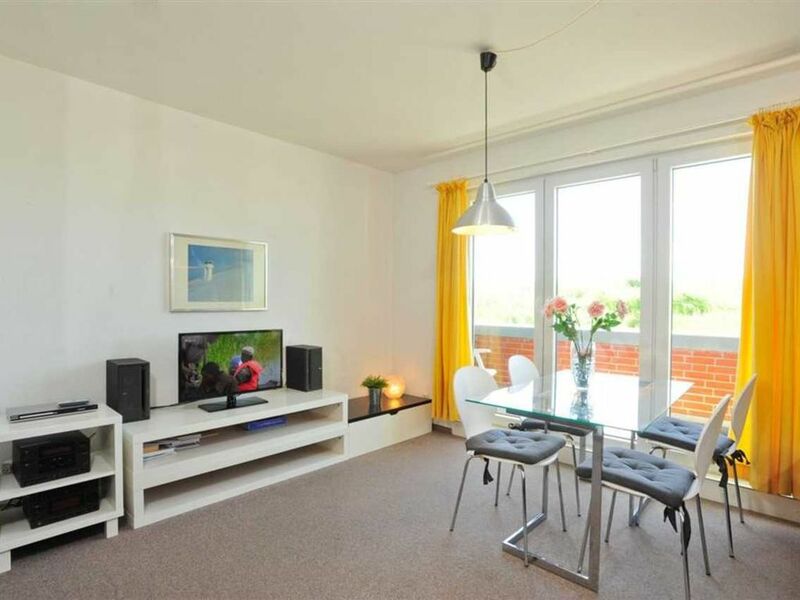 Living room with 2 sofas, one of which is a pull-out sofa bed (145x200cm), an armchair, dining table with 4 chairs, TV (satellite), stereo compact system and DVD player. Direct access to the furnished balcony. Open kitchen with oven and fridge freezer. No microwave, no dishwasher. Bedroom with double bed (2x 100x200cm), single bed (90x200cm), wardrobe, chest of drawers, bookshelf with reading, rocking chair and a table with 3 chairs. The bedroom leads to a steep, narrow staircase. Bathroom (bath) with bath, toilet and daylight. No hair dryer. Hall with wardrobe in the entrance area. Parking space at the house. No WLAN. NOTE: from 29. September 2019 dogs are welcome in this domicile. Good location right on the North Sea dike! You reach from the apartments the beach Ordinger in a few minutes walk, shopping and restaurants are partly in the district Ording and often in the spa center of St. Peter bath available. From the bedroom in the attic, you can look over the dike on the watt and sea in both apartments.